To the ardent gamer, Rise of Kingdoms appears as an amalgamation of a few different game genres. Taking the best bits available and adding in their own unique flavor, the creators have really managed to create something spectacular in the form of this game. 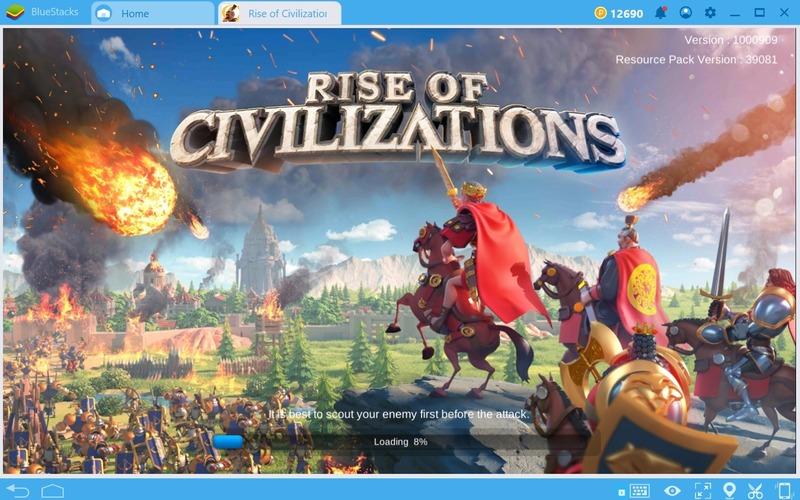 Rise of Kingdoms begins by offering users the choice to choose from a total of eight different civilizations. This initial choice will set the foundation of your whole game. Even though there is a way to change your civilization later on but it comes at a cost. A colossal cost of 10,000 gems that is! Each civilization comes with its own unique hero. Although you may factor in the hero while making the decision but it should not be the ultimate deciding factor. Heroes can be obtained later on in the game irrespective of the choice of civilization. Let us take a look at the bonuses and unique troops that come with each civilization to help you make up your mind better. 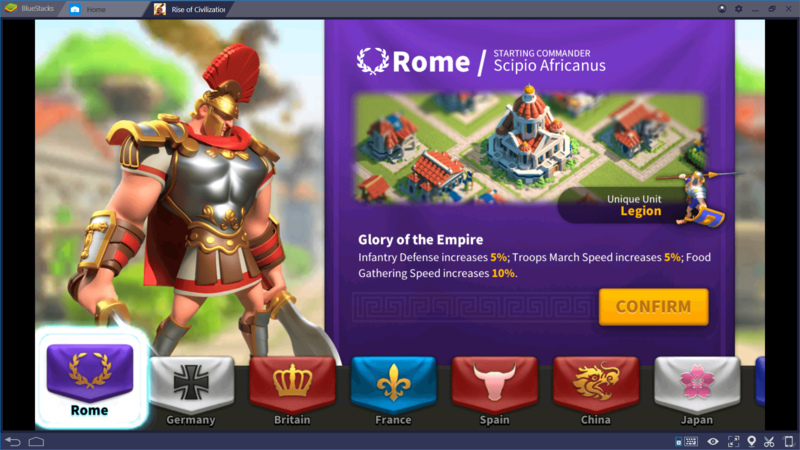 With the starting commander Scipio Africanus, Rome is all about speed. The unique unit is an infantry special called Legion. With the all important role of troops in mind, increased infantry defence can be a useful trait to possess. The commander and troops of Rome provide an imposing presence in the game. Increased troop march speed means faster initiation of attacks and overall more efficiency of troops. Hermann is the starting commander for Germany. He is a great commander to defend your city with. Germany has the unique cavalry unit Teutonic Knight. With faster troop training speed along with quick action point recovery, you can attack more often. This is a great advantage and is the reason that many players prefer to start with Germany. 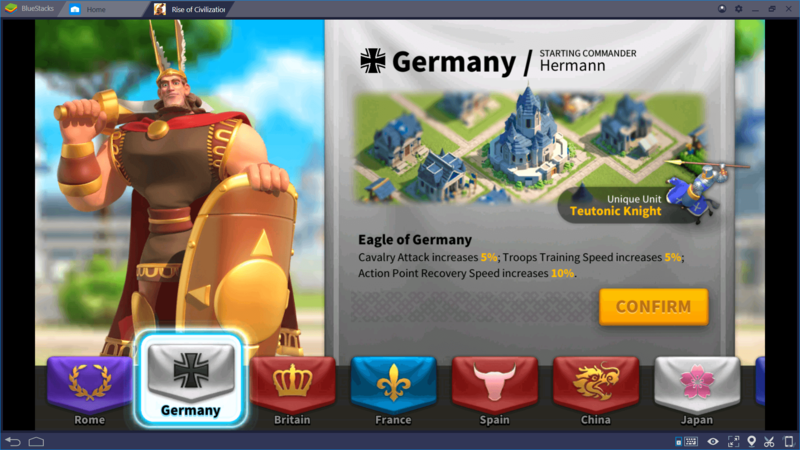 Germany may very well be the strongest civilization in this game. 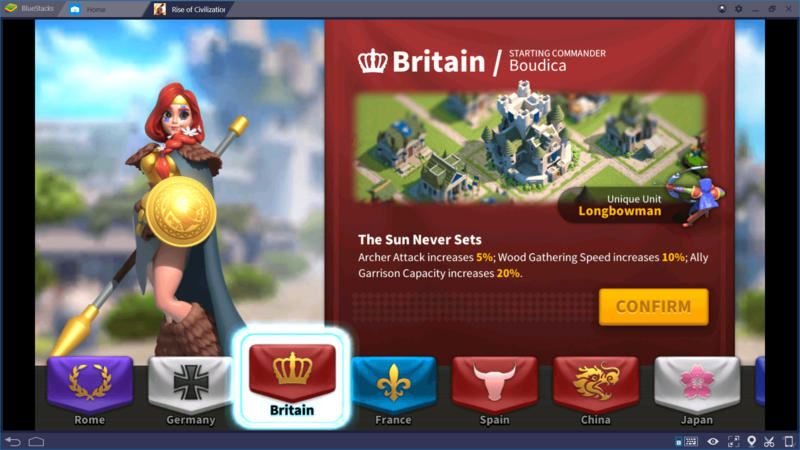 Britain has Boudica as the starting commander. Unique unit is the Longbowman (archer). The stats of Britain are not as impressive and useful as those of some other civilizations. This civilization can be seen as having more of a ‘support’ role. While the commander of Britain is likable but the lack of any significant perks and bonuses make it probably the weakest civilization in the game. 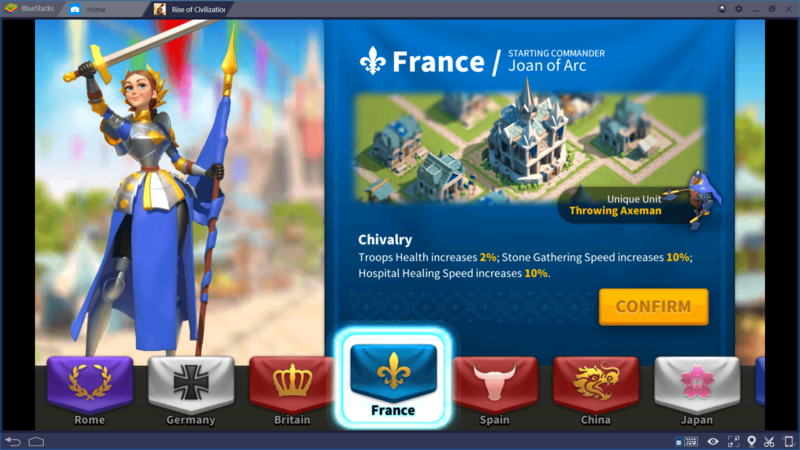 The starting commander Joan of Arc specializes in gathering resources. The other stats of France also reflect attributes that make it a resourceful nation. Unique unit is the Throwing Axeman. If we compare the perks of France with other civilizations, we might find them a bit underwhelming. While they emphasize greatly on resource gathering, all other vital aspects of the game are being neglected. Spain has its main focus on cavalry units. The starting commander is called Pelagius and the unique unit Conquistador is a worthwhile cavalry unit. All three perks of Spain are pretty handy and therefore make this civilization worth considering. Gold is one of the rare resources which appears in the later stages of the game. An added speed increase in gathering gold can give you an edge if your strategy relies heavily on gold. China is among one of the community favourites with a lot of users opting to start with China. The infamous Sun Tzu leads the armies. Unique unit is the archer type Chu-Ko-Nu. 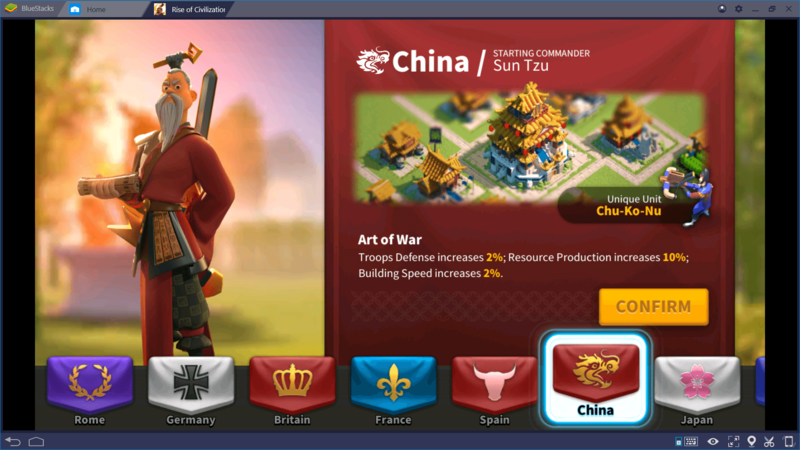 China boasts of a pretty strong defence that in turn is useful to protect your valuable resources. As a civilization, China can be pretty fun to play with. Having a good starting commander like Kusunoki Masashige gives Japan an edge over some of the other civilizations. 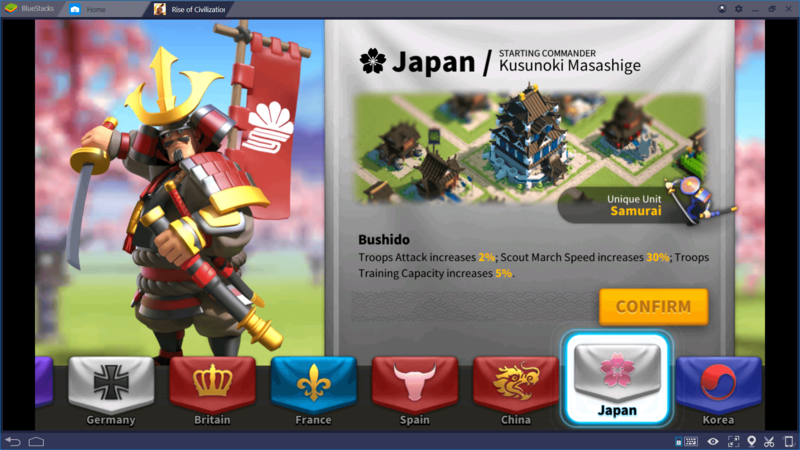 The unique unit is the legendary infantry troop Samurai. In terms of perks, Japan has a mixture of good and pointless ones. Troop attack bonus and added training capacity are pretty neat perks to have. Once again we have something almost at par with Britain. 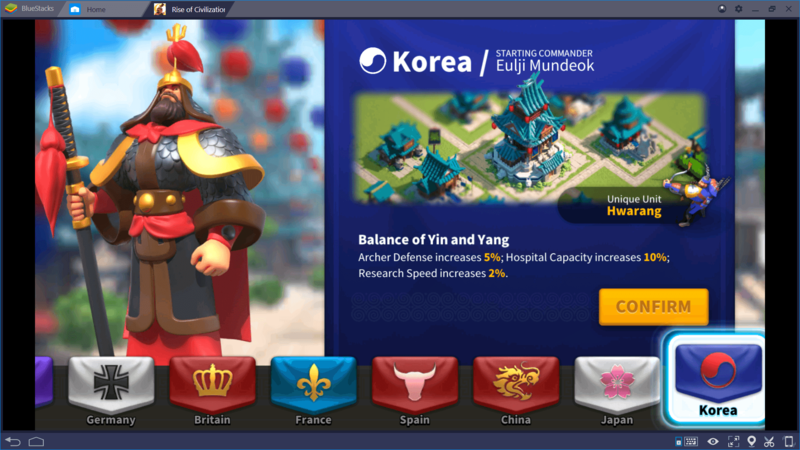 While the commander Eulji Mundeok is competent, but the perks like increased hospital capacity is impractical in the game. The unique unit Hwarang also doesn’t quite help in making this civilization much appealing. 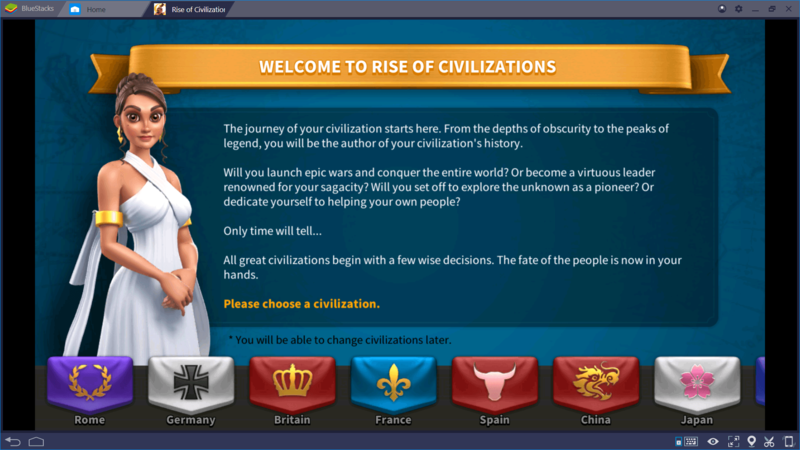 The ultimate decision on selecting a starting civilization is just a matter of personal preference. While some perks may give a little added benefit here and there but in the end it all just comes down to strategy and how well you adapt yourself to the environment. For us, the civilizations that appear to be better than others one way or another are Germany, China, Rome and Spain. Now that you have hopefully made your initial decision, the rest is a glorious adventure. With the power of BlueStacks at your disposal, you can take the whole gaming experience one notch further. Rise of Kingdoms is a pretty demanding game, with so much going on in the vast map it is often hard to keep up with everything. 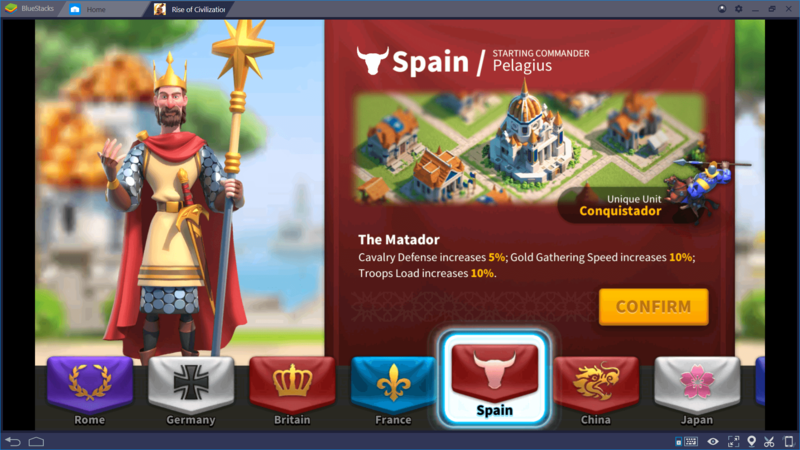 Now with the new BlueStacks 4, the whole strategy game experience has been made as smooth as possible. You do not have to worry about small screens and laggy phones! GLHFPlaying@BlueStacks 4.